For Sale in Pwllheli for Guide Price £300,000. BY INFORMAL TENDER . A very valuable building plot in a unique location off golf road and only a few hundred yards down to Abersoch main beach and the Golf Course. Easily accessible into the village centre. Rarely do building plots become available in this position with the benefit of full planning consent granted by Cyngor Gwynedd Council ( no onerous conditions ) for the construction of a detached Contemporary designed 4 Bed Residence and a det garage. The proposed building will afford an L shaped dining/kitchen, lounge, 2 en suite g/f bedrooms, with two further f/f bedrooms and bathroom. The site shares an entrance with the adjoining property " Grianfryn " and adjacent to Trofa. 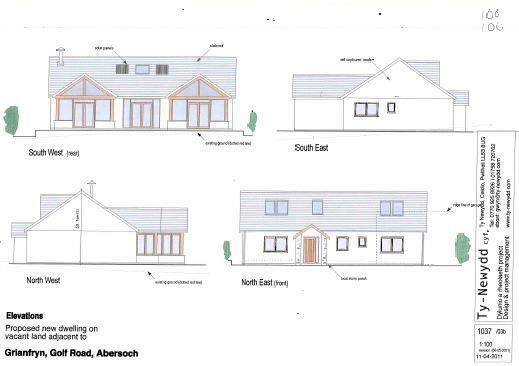 The detailed plans of the proposed dwelling and the formal consent notice, maybe inspected at the agents, Abersoch Office. OFFERS TO BE SUBMITTED IN WRITING FOR THE VENDORS CONSIDERATION BY FRIDAY 17th AUGUST 2018 AT 12 Noon.